The Nokia Lumia 928 is the Finnish phone maker’s latest flagship device and boasts a PureView camera and Carl Zeiss wide angle lens, along with NFC. The handset has a 4.5-inch 1280 by 768 Amoled display and supports wireless charging. A 1.5GHz dual core Qualcomm Snapdragon S4 drives the Lumia 928, which runs Windows Phone 8. 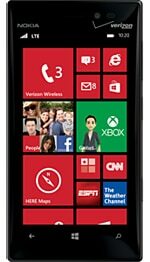 The Lumia 928 is available from 16 May 2013 in the US, exclusively on the Verizon network.